The outpouring of love and support and donations..... we really don't know what to say or how to say it. There are no words—nothing we can do could ever feel like enough to share our sincere gratitude. The only thing we can think of that almost fits is thank you—but for some reason those two little words just seem so small and simple. Definitely not enough for all that we have received. But that's it. That's all the English language has to offer—after racking our brains we could think of nothing else. Thank you so so much. Your contribution, whatever it has been, has made all the difference to us and we are so grateful for you and your kindness. 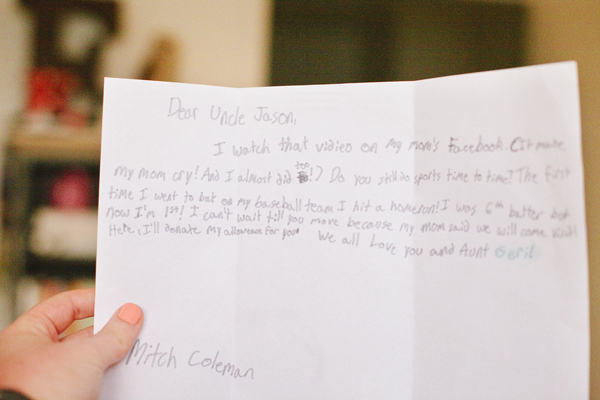 *the little letter from our nephew: "Dear Uncle Jason, I watch that video on my mom's Facebook. (It made my mom cry! And I almost did too!) Do you still do sports time to time? The first time I went to bat on my baseball team I hit a home run! I was 6th batter, but now I'm 1st! I can't wait till you move because my mom says we will come visit! Here, I will donate my allowance for you. 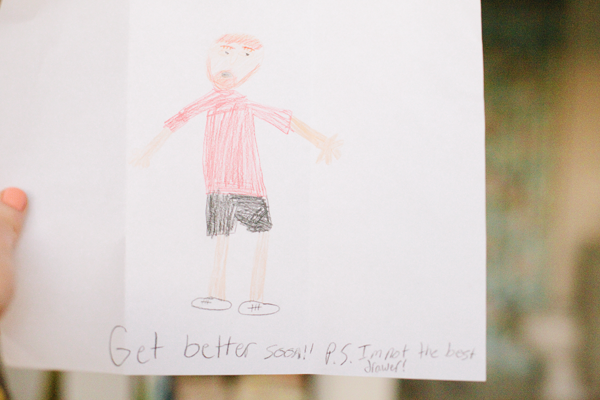 We all love you and Aunt Geri! Mitch Coleman"